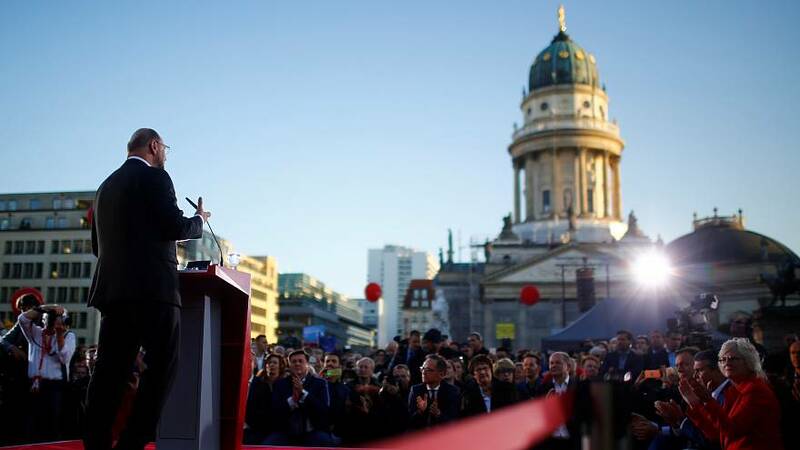 Martin Schulz’s second-last rally before Sunday’s German election has taken place at Berlin’s historic Gendarmenmarkt Square. Making one of his last appearances in Berlin is iconic because he arrived here from Brussels just months ago. Schulz had never been a minister or anything else in German federal politics when he was elected chairman of the SPD. He then became top candidate to the Bundestagswahl. Some say that this was his weak point during the campaign, mainly because his CDU counterpart Angela Merkel is a old stager in German federal politics and voters may tend to trust in her experiences. Schulz gave his speech at Gendarmenmarkt surrounded by other SPD polticians such as Michael Müller, Major of Berlin and Katharina Barley, Minister of Family Affaires. Security was high and people queued to get on to the Gendarmenmarkt to see and listen to Schulz. He hopes to get votes from the still undecided voters who are said to be as many as 30-40 percent. On the last week-end of campaigning, the SPD will launch a intensive “attack” on voters. Politicians will go door to door and make phone calls to convince voters. Their slogan: “Stay awake and fight for equity.” The last polls out the SPD at just over 21 percent, so this could be seen as a sign of desperation. SPD’s result in 2009 was 23 percent, in 2013: 25.7 percent. Schulz’ last rally will be on Saturday in Aachen on the Belgium border next to Würselen where he used to be mayor. This is also where Schulz will be voting on Sunday. He then plans to travel back to Berlin to wait for results – and then to do what ever he has to do: negotiate a coalition with CDU/CSU, withdraw to become opposition leader and recreate his party or step back from power within the SPD. It depends on the result.